All we need is music . . . sweet music. ---- lyrics to "Dancing in the Streets"
In a wonderful recreation of the heady days of the 1960s, the new musical Dancing in the Streets comes to London's Cambridge Theatre. An energetic, talented and slickly professional cast recreate the classics Mowtown hits which are almost as well known today as they were forty years ago. 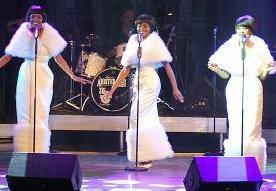 Dancing in the Streets may be a tribute concert but it is a show of the highest standard and looks likely to find the kind of audience that keeps The Rat Pack running two and a half years after it opened. I couldn't help smiling at the old fashioned choreographic moves as the guys recreate those cheesy synchronised actions of groups like The Temptations. It is interesting to reflect on how much movement has evolved for singers. Each solo singer takes a backing part while each backing singer takes a solo turn. I admired their versatility and sheer verve. The sounds are as I remember the originals, the orchestrations the same. There is nothing here to interfere with nostalgia. There is no story line but Ray Shell, a veteran star of many a West End musical, links the acts with an amusing introduction reminding us of who and when and how sensational these acts were as well as how many weeks they were at number one. Ray Shell himself also takes on several solo numbers from the repertoire. The music is beyond words, from Jimmy Ruffin's "What Becomes of the Brokenhearted" to Marvin Gaye's I Heard it on the Grapevine to the Supremes "Baby Love"; these tunes are iconic. As the sound is so good, I would have thought that this was the casting priority but the lookalikes are convincing too, especially the singer playing Diana Ross with a lovely wig and spangled frock to add to the performance. The guys too have flamboyant costume fun with yellow satin South American shirts with ruffles to complement the hip swerving choreography. The girls sound wonderful whilst looking authentic like those cable programmes which show old television clips of the Mowtown acts. The music has not dated the way the excesses of fashion and bizarre wigs have. The performers have obviously studied their role models for mannerisms. All the artists are uncredited by solo part in the programme but I think it was newcomer Nathaniel Morrison who as little Stevie Wonder recreated Stevie's way of placing his hands on his front while gazing up as he sings with a child like innocence. Most of the audience are here to join in and no one could have stopped them standing to appreciate the last half dozen numbers of the show. "Reach Out" and the title song crown a majestic and soulful evening. What is so good about this show is that all the favourite songs are here. Dancing in the Streets may not be groundbreaking theatre but it is patently what people want, performed to perfection.